Excellent thanks! Will add a note to the article, for some reason I thought I tried the dropbear config but must have had wrong option. Is the method to root the Hue-Bridge still working? I have a new hardware version (2.1). There are some messages when I power up the device, but then it stops (and hang up?). The last message is “Stack Pointer at: 80xxxxx”. Huh – haven’t seen the newer HW version. Perhaps they added a check to try and avoid this attack? It is still working. The problem was that the RX-line of my RS232 device was pulled up to 3.3V. I tried a diffrend device where the RX-line wasn´t pulled up and I was able to root the device. Thx! Maksimo, which PCB test point did you use for 2.1 hack? As I look on the PCB, there is no test point in the corner of of the chip. There is one bit further down towards smaller chip (the one with 8 legs). Is this the one to be used? I got dropbear to work when using md5 hashed passwords instead of sha-256. I read somewhere that uClibc, which is used by dropbear doesn’t include sha-256 and sha-512. Thank you Colin for great video and images. Originally I stumbled across the article on “enabling Wifi in Hue” that lead me here. 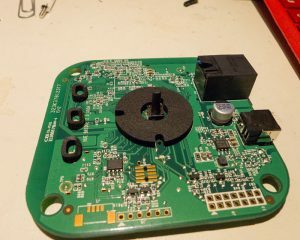 I searched on, because I had a v2.1 board, and the instructions/pics were only for v2.0. Unfortunately I didn’t take any pictures, but thought I’d share what I gathered none-the-less. The layout has changed a bit, and I’m sure they dropped a bunch of “extra” components in that update. But the SOC and flash are still the same, and in the same place. If you hold the board in the right angle, you can also see (faintly) the zig-zag-lined “connection” between them slightly of to the right of the smaller bottom IC (flash). And really faintly also that single connection to the TP/Flash. So the actual TP is slightly lower and off to the right compared to the 2.0 layout. I’m not sure why, but as I started, I had the impression that part of the serial was being fed through the GND/RX/TX line and therefore it kinda stuck. Power off device, pull serial, power on, replug serial and then short TP ended me in a shell with some nasty “checksum” error. So it worked, but can’t guarantee it was the “proper” way (i.e. foolproof as to impossible to do some damage if shorted longer or whatnot). I didn’t quite get all this business on what kind of password hash to use – “mkpasswd -m SHA-256” on Rasp with jessie worked fine for me. A bit more headache was the ssh (-key) business. “echo ‘[PUBKEY]’ | ssh-factory-key -r – ” seemed to work (it also opens FW, if not done so already). But putting it all back together and booting with eth-cable, ssh -i mykey root@hue came up with something like “remote agents admitted to fail to read/sign key” or something strange like that. Hmm – bummer. Back to open that box, hook up serial and start screen. Dropbear has a tool to create a key – dropbearkey – used it to create one on the box. Echo’d its public part to ssh-factory-key and it worked (it stored the key alright). Checked option in /etc/dropbear – all fine. Now cat private keyfile, to C&P on my desktop – ouch – that bugger’s binary! No – I didn’t dump it and re-assemble on the other end via hexdump, but it was useful in checking on both ends if the transfer worked. What I did was use “openssl enc -e -a ” – ascii armored “null” encryption if you like. Gives nice formatted block of C&P’ble Ascii and then on my desktop “openssl enc -d -a” reverts it back to binary. Haha – thought that was it, well it wasn’t. The ascii didn’t go into an ssh-key and neither would (open-)ssh read the binary form – kept asking me for a password ;). But there’s a tool that comes with dropbear “/usr/lib/dropbear/dropbearconvert ” (again I found this on my Rasp-3-Jessie) – it’s a bit clumsy, but converts the Hue-generated (did I mention it took forever to create it?) key into a standard openssh-ascii format. Now, piece it all back together, fire up on LAN and – voila – it worked. Logged out and wanted to go back in – dammit, that strange “remote agent admits…” error again. Hmm, retry – same error – retry – Bingo! So, seems like the original C&P may have worked – just that the hardware on the HUE (and probably software as well) isn’t fast enough to use good encryption (my original key was 2048 bit…). Just try it a few times, and you’ll get in (as long as it’s this “remote agent admits to ….” error at least). I noticed that the interaction with the bridge en online platform (my.meethue.com) seems to stop when using a different root password. I seems to be that the securitystring (hashed password) in the environment is used for online authentication. When i restored the original value it was working again. In the end, i created a new useraccount and gave it root permissions. i’m in the process of rooting my bridge, bootdelay and new security set but as soon as i reach the login prompt and enter “root/toor” as username/password, it randomly garbles a few characters causing the login to fail. I already power cycled a few times, tried typing *very* slowly – still garbled. The output before isn’t at all garbled and also in the u-boot prompt all characters get transmitted and received nicely. I now suspect the settings of serial connection, will try that next. Did you set any special settings in Putty regarding characters and/or serial connections? I am having the exact same issue. Have you managed to sort it our somehow? I am having the exact same issue.. Have you managed to find a solution? I tried this with the 2.1 bridge and your guide is correct except for the UART pins being switched and the bridge not booting with the UART pins connected. I was able to get boot output to time the corruption by doing a factory reset which resets the bridge and works with UART connected. This gives me the “ath>” but when I press enter I get no response and no further “ath>”. It doesn’t seem to respond to anything. Any ideas? Okay, by timing my corruption better I can get a functioning uboot shell, but it won’t accept any multi-letter commands. The only one I could get to work was ?. Not even help would work. Sounds like maybe hardware issues? 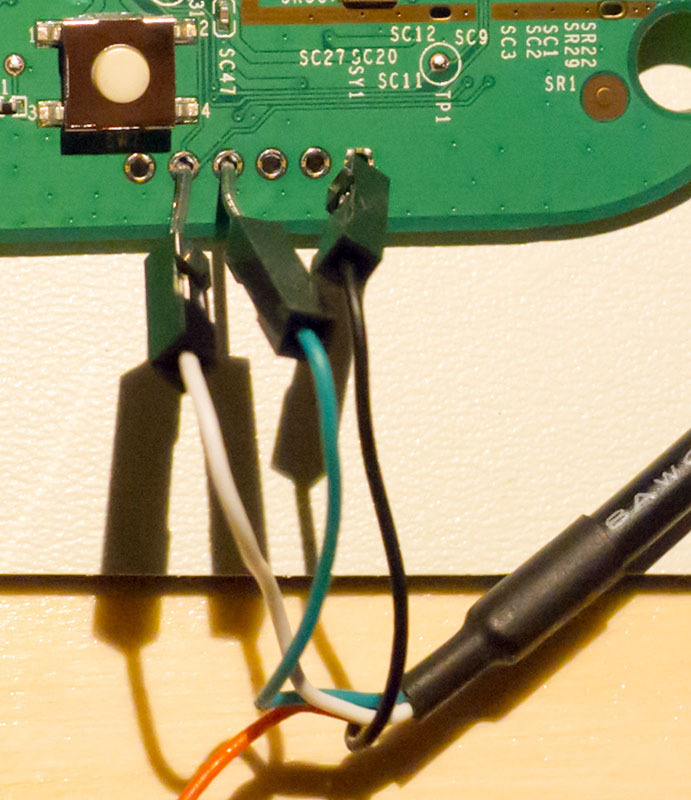 Hard to say… is there a bad connection on the GND or UART pins? Great post! I was actually hoping to gain root access to the Hue in order to flash it with a custom build of OpenWRT. 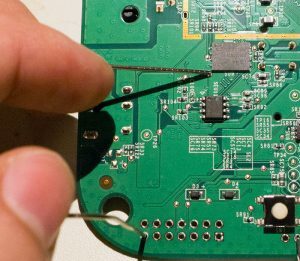 I’m completely new to working with OpenWRT, however, so I’m having issues finding the right kind of build and the right way to flash the firmware. Do you have any recommendations? if you edit /usr/sbin/ipbridge in hexa and you modify the string eth1 to wlan0 and you use hue esentials app and look for the bridge on the IP, you can control the damn lights. Also, completly disable eth0 from the configuration. For V2.1 use short the NAND’s DO signal to GND instead of the test point that was mentioned. and I’m having proble identifying the pins. How did you come to the conclusion that the chip is W25N01GV? And a nice video of Hue Bridge running on WiFi controled by Siri. In the latest firmware opkg isnt included anymore. Does someone know how to install it again? I try to root my hue bridge that i buy specially for trying to understand how remote api works as i create a hue emulator script and all futures based on remote api are not working. When i connect the serial adapter with indicated pins i get just some characters on power on, but then no debug logs are displayed. I reverse TX/RX pins but no luck. Baud rate was set to 115200 like in the video. I tried to create that shortcut after 5-6 seconds on boot, thinking that they only disable the debug messages, but i did not manage to enter in uboot menu. Any idea if they fixed this root method and currently is not possible to perform the hack? It’s been fun learning from this tutorial. Everything was working, I thought, tried with the new instructions to enable ssh and manged to ssh locally root@127.0.0.1 while the serial console cable was still connected and it worked. Well I put it all back together and can’t telnet or ssh into my hue over the network. FING (nmap) for android does not show ssh or telnet as running, when I scan ports only http & https services are shown. By any chance… did anyone got the JTAG working?